V Pedal Wireless Foot Pedal: This is quite a popular foot pedal model which even comes with a USB port, in case you would prefer an alternative to the wireless function mode. This model is compatible with MAC computers as well as Winndows 7 and supports a number of well-known software programs. The three pedal functions are very easy to use and can be set up within minutes. This particular model can be easily purchased online as well. MotorGuide Brute Wireless Foot Pedal: On first sight, what catches the eye is the simple yet unique shape of the foot pedal which has well marked panels with easy to read letters. Users are certain to like the on/off panel which is usually not found in most other transcription models. MotorGuide allows the user to control the speed of any file that is being played and is compatible with most software programs too. If you’re the kind who prefers to work while standing, then this well designed foot pedal allows you to do so with minimal discomfort. Remember that most wireless models offer a very limited wireless radius which means that you would have to be in the same room as the foot pedal for maximum uninterrupted efficiency. 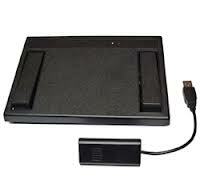 In comparison to USB foot pedal models however, wireless foot pedals come second in terms of popularity.